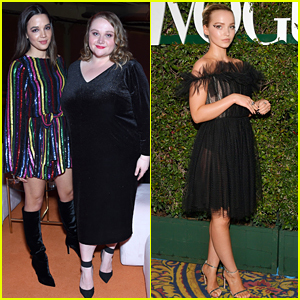 Danielle Macdonald meets up with her friend Georgie Flores while attending the Teen Vogue Young Hollywood Party at the Los Angeles Theatre on Friday night (February 15) in downtown Los Angeles. The 27-year-old actress was honored with one of the mag’s five covers for the Young Hollywood issue. The event was presented by Snapchat. Danielle‘s co-stars from the Netflix movie Dumplin’, including Georgie, Dove Cameron, Bex Taylor-Klaus, and Luke Benward, all stepped out to show their support. Dove channeled Black Swan with her black dress and eye makeup! 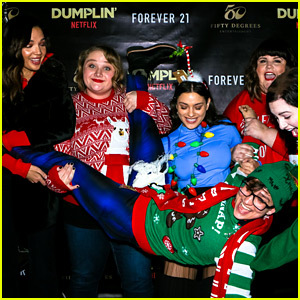 The stars of Dumplin’ – Georgie Flores, Danielle Macdonald, Odeya Rush, Bex Taylor-Klaus, and Maddie Bailio – pose for a fun photo while attending an Ugly Christmas Sweater Party with Forever 21 on Friday (December 7) at Cha Cha Lounge in Los Angeles. The cast members were joined by Julie Murphy, the author of the book “Dumplin’,” and RuPaul’s Drag Race star Ginger Minj, who appears in the movie. Dumplin’ was released on Netflix that same day and you can stream it now! 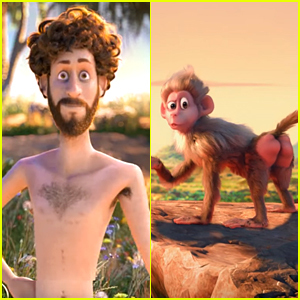 “Viva la revolución, baby. Alt caption: Spartacus WISHES he had this squad. Had a brilliant time at the @forever21 ugly Christmas sweater party and toy drive celebrating Dumplin and collecting for the boys and girls club!” Bex wrote on her Instagram account. Get an Exclusive First Look at 'Hell Fest' with These Photos! The new horror movie Hell Fest is hitting theaters this weekend and we have some exclusive photos for you to check out before seeing the film! In the movie, a masked serial killer turns a horror themed amusement park into his own personal playground, terrorizing a group of friends while the rest of the patrons believe that it is all part of the show. The young cast includes Rise‘s Amy Forsyth, The Bold and the Beautiful‘s Reign Edwards, Scream‘s Bex Taylor-Klaus, Nashville‘s Christian James, and more. The Walking Dead‘s Gale Anne Hurd and Limitless‘ Tucker Tooley are the producers on the film and it was directed by Paranormal Activity: The Ghost Dimension‘s Gregory Plotkin. See Hell Fest in theaters on September 28! Dove Cameron and Famous in Love‘s Georgie Flores have joined Dumplin with Jennifer Aniston. Deadline reports that the flick will focus on Willowdean (Danielle Macdonald), nicknamed Dumplin, a confident, plus-sized teen who, to spite her beauty pageant queen mom (Aniston), enlists in a local pageant. 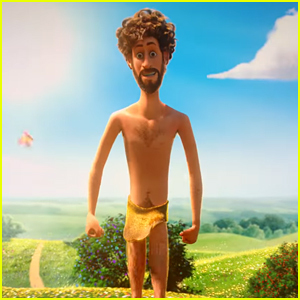 Luke Benward, Maddie Baillio, Bex Taylor–Klaus and Ginger Minj will also star in the movie. 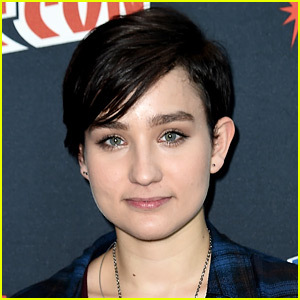 Bex Taylor-Klaus, one of the stars of MTV’s Scream series, has come out as gay. The 22-year-old actress, who has also been seen on The Killing, tweeted to her fans before starting a YouNow stream to answer questions. “hello my name is bex and yes the rumors are true I am v gay,” she tweeted. One fan asked Bex is she was scared to come out during today’s times.